Support Our Schools - Loudoun: Are you still paying attention? Are you still paying attention? Plans have changed again. Any votes on the school budget have been delayed to this Thursday, March 20, at the earliest. Attend the Board meeting Wed, March 19 to tell them what you think of their plans to not fully fund the schools budget. Last we spoke, the Board of Supervisors was planning to take any votes on the funding for the schools last Thursday, March 13, or tonight, Monday, March 17. On Thursday, the BoS did not take up the schools budget at its work session, and on Friday, the BoS announced that the work sessions scheduled for tonight was cancelled as unnecessary. The next work session will be Thursday, March 20. With the snow, it ended up that tonight's session probably would have been cancelled anyway, had they not done it already. The original schedule would have allowed for a public input session where people could have responded to any straw votes taken on the school budget at the work sessions at the Board of Supervisors regular meeting March 19. Now, any votes taken at the work session could potentially be adopted before the BoS hears public input at their April 2 meeting. Last year, they voted on the budget as amended in the work sessions prior to hearing public input at that meeting. So, it seems, we go into the March 19 public input not knowing much more of the supervisors stance before the process started. We've established that e-mails to the BoS and speakers at the public hearings are overwhelmingly in support of fully funding the School Board's budget request and aware that it means taxing them on the rise in their property assessments. It may be in the supervisors' interests that the public not see or hear if they go against this active majority, so they are stalling any public declarations of their decisions. Perhaps they are hoping that you are going to lose interest and stop paying attention. Supervisor Delgaudio (Sterling) is the only supervisor so far to flatly state his or her intention on the schools' budget. He said that he will motion to give the schools no increase over last year's budget. The County Administrator has proposed an increase of $45.5 million in the county transfer following the BoS guidance of a reduced tax rate of $1.155. The BoS has gone through every county department's budget request during the prior work sessions and has not made many reductions to them. Thus, any significant increase in the school transfer over the proposed amount will require the tax rate be set above the current BoS guidance. A majority of the supervisors have said that they will not support fully funding the School Board's budget request. Supervisor Reid (Leesburg) has suggested he may support a tax rate of $1.175 or $1.185. Others have hinted that as well. That rate would still represent an approximate $20-30 million cut from the School Board's request. The upshot of the delay is that you have even more time to contact this Board and let them know your thoughts on the schools budget before they vote. We only need to convince five supervisors to do the right thing. 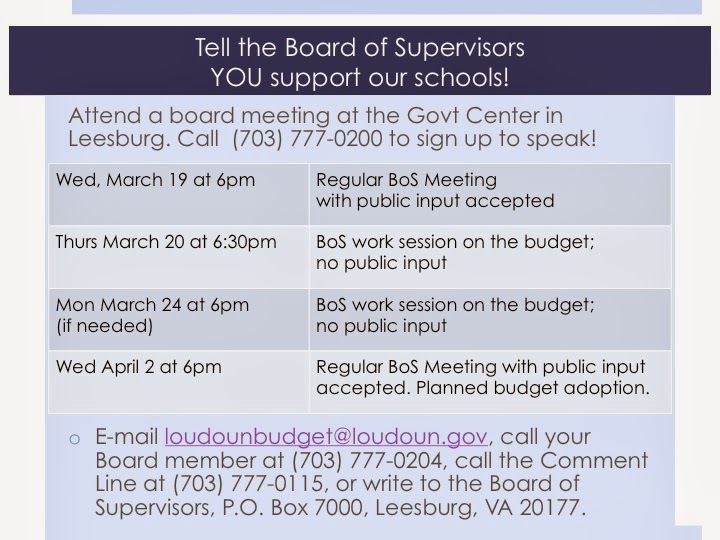 Email your supervisors and cc: loudounbudget@loudoun.gov. Plan to attend and speak at the Wed, March 19 or Wed, April 2 regular board meetings. To sign up, call (703) 777-0200 in advance or sign up in person when you get there. Show the Board that you are still paying attention. Well, that didn't work...now what?